The maintenance work required to meet the critical needs of users is as follows. Publishing: including code management, compilation, packaging (e.g. for Ubuntu, other Linux, Windows, macOS), download, licensing, documentation, cloud deployment and promotion (e.g. newsletter, social media). Repair: maintaining a tracking system for users to report issues; resolving issues promptly; publishing updated software to the public development line and packaging it for easy installation. Redesign: reducing complexity to a sustainable level by modifying code interfaces, refactoring code, reducing duplication and improving functionality. The cost of maintenance is € 250k per year. The OpenFOAM Foundation offers Maintenance Plans for organisations to contribute to this cost. 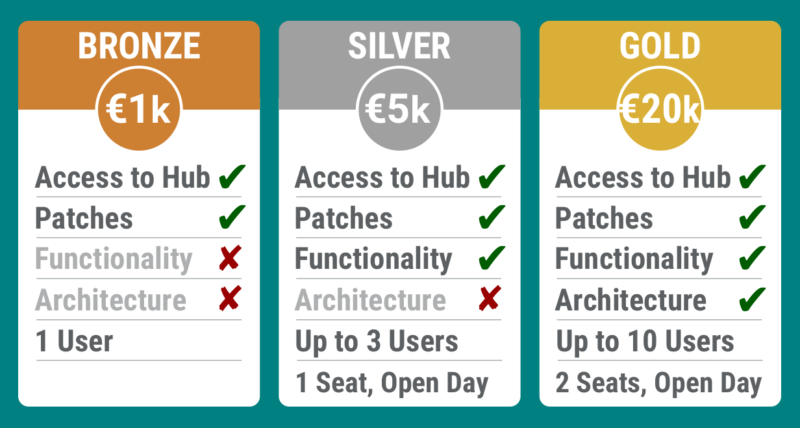 There are three levels of Plan: Gold (€ 20k per year); Silver (€ 5k); and, Bronze (€ 1k). The work funds for a full-time team of core developers with combined skills in software design, programming, numerics, science and engineering, mainly at CFD Direct (including OpenFOAM’s creator, Henry Weller). The funders and contributors of OpenFOAM decide what happens to the software from within the Hub. If you do not fund or contribute, you can still use the software but have no say in how it evolves over successive releases. To contact us about a maintenance plan, click the plan name/price below.